Every November, that great American feeding frenzy comes around. And each year, it involves two things: A plate full of amazing food that almost always elicits gratitude to the cooks involved. Secondly, an overwhelming desire to stretch out on the floor afterward even while our swollen tummies still crave more. It’s an American tradition that shows no sign of stopping. We can easily scarf down 3,000 calories at this dinner alone. Add on drinks, a bountiful relish tray and a slice of whipped-cream-laden pie, and your total can edge up to 4,500, according to the industry group Calorie Control Council. We at Devour do not judge. In fact, we endorse this unrivaled feast because it involves family, friends, food and mirth. So, let’s make sure that it’s a grand occasion. Whether you’re an old hand at hosting your family’s extravaganza or if this is your first rodeo and you have no idea of what you’ve got yourself into, Devour is here to help you execute a resoundingly successful meal. To that end, we brought local chefs together for a Thanksgiving potluck. 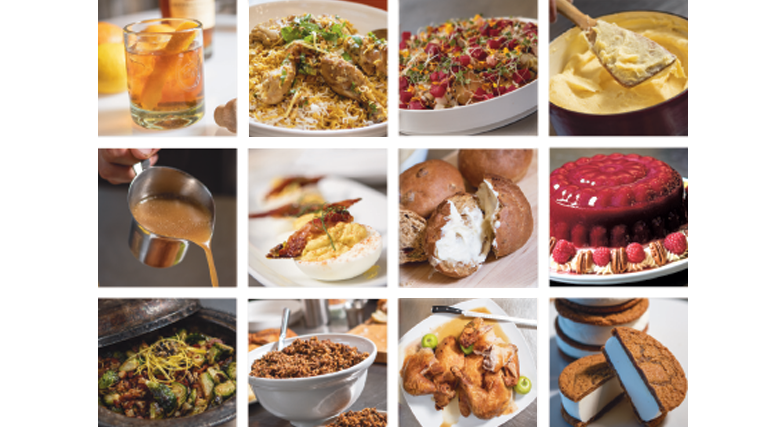 These culinary stars shared not only their hallmark dishes but also their recipes for our readers. So, enjoy drinks and appetizers from High West’s Steve Walton and Michael Showers; a dry-brined turkey and gravy from Park City Culinary Institute chef Jordan Miller; traditional Greek stuffing from Manoli Katsanevas and Katrina Cutrubus—owners/chefs at Manoli’s; cheesy potatoes by Oak Wood Fire Kitchen’s Brandon Price; Brussels sprouts by KUTV 2’s Bryan Woolley; smoked parsnips from Handle/HSL’s Briar Handly; a molded gelatin salad by Amber Billingsley, pastry chef at Stanza and Current Fish & Oyster; aromatic Hyderabadi chicken dum biyani by Lavanya Mahate, owner/chef at Saffron Valley Indian Cuisine; cranberry dinner rolls with bourbon butter and classic red wine by University Marriott Thistle and Thyme’s Jason Talcott; and gingersnap ice cream sandwiches by Alexa Norlin of Normal Ice Cream fame. How perfect is that? You have in your hands a world-class T-day dinner. The recipes that follow were chef-created and food-writer tasted to great acclaim. So, let’s get started with a classic cocktail, one created by Steve Walton, High West Distillery’s friendly bartender. 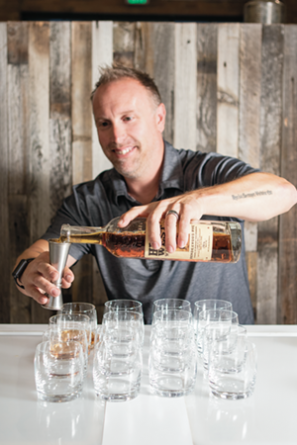 As beverage director at High West, Steve Walton oversees the bar operations at High West’s four locations. He is also the founder of the Utah chapter of the United States Bartenders Guild and competed in the USBG World Class Cocktail competition in 2016, where he was one of 12 competitors who made it to the Southwest regional finals held in Park City. 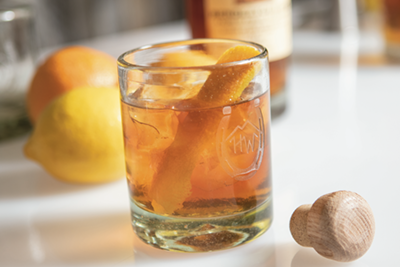 His classic Old Fashioned is traditionally served in a short, round tumbler. Dissolve sugar with a little water in a rocks glass. Add two dashes of Angostura Bitters. Muddle until sugar is dissolved. Fill glass with ice cubes and add rye. Garnish with orange or lemon twists. 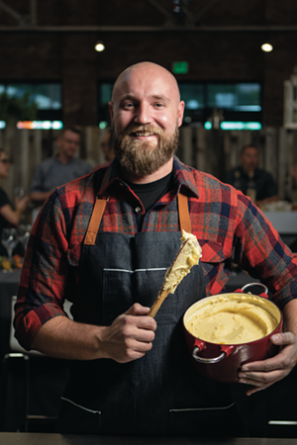 Executive chef Michael Showers joined High West in 2018. 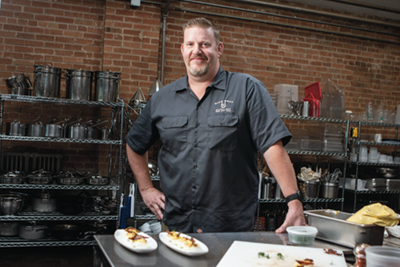 After a stint as corporate chef and seafood specialist for Nicholas & Co. , Showers opened the DeJoria Center in Kamas in 2015, serving as both executive chef and food and beverage director. Now leading the team at High West Distillery, Showers is charged with pairing High West’s cuisine with their award-winning whiskeys. 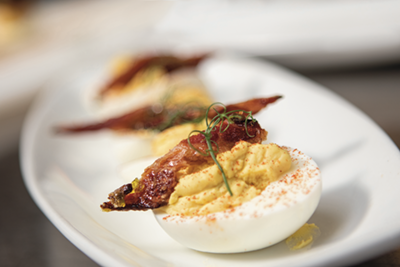 His spicy deviled eggs are just the right touch to whet your appetite, but enough to tide you over until the meal is served. Separate yolks from whites and reserve whites on a single layer tray. In a mixer, place yolks, mayo, mustard, jalapeño, cumin, smoked paprika, salt and vinegar. Mix on slow till all ingredients are incorporated and can pass through pastry bag. Place in bag. Cook bacon at 375 degrees for 7 minutes. Pull bacon and glaze with jalapeño jelly and cook for 3 minutes more. Gently pipe yolk mixture into whites just barely coming above the top. Once bacon has cooled, break or cut into little triangles and place 1 piece on each egg in the deviled mixture. Garnish with chive and paprika and enjoy. 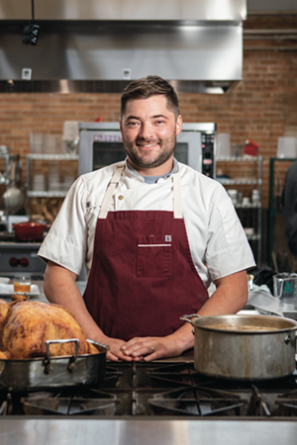 An instructor at Park City Culinary Institute, award-winning chef Jordan Miller has opened acclaimed restaurants in Maryland, Delaware and Utah. 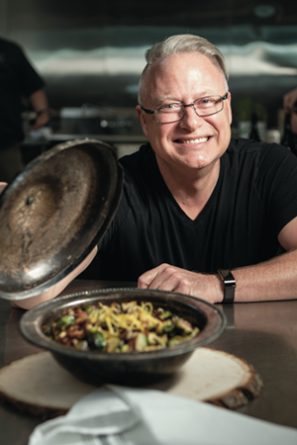 Trained in Quito, Ecuador, at the University of San Francisco, Miller most recently managed the food and beverage operations of the Sky Lodge Hotel in Park City. Traveling extensively in the Americas, Jordan has an intimate knowledge of a number of ethnic cuisines. When it comes to picking out a Thanksgiving turkey, Miller notes that with turkeys under 16 pounds, figure 1 pound for every person, a ratio that factors in bone weight. For turkeys over 16 pounds, figure ¾ pound per person because larger birds have a higher meat-to-bone ratio. For ample leftovers, he says, a safe ratio is 1 1/2 pounds per person no matter the size of the bird. As for prepping the turkey, Jordan recommends dry brining for whole turkeys. Not only does it save space in the refrigerator, it concentrates flavor. Traditional wet brining will plump and add weight to your turkey by adding additional moisture to the flesh. While not a bad thing, he says, the added moisture is comprised of water and leads to a turkey that is a bit watered down. The result will be moist and juicy, but the taste will be lost in dilution. Dry brining helps the bird retain moisture while cooking without adding any extra liquid. The bird will absorb the salt, which denatures the protein and creates a more intense poultry flavor. The addition of baking powder to the dry brine also improves the quality of the skin because it changes the pH of the bird and aids in breaking down proteins. The baking powder combines with the natural juices of the bird and creates a layer of microscopic carbon dioxide bubbles on the skin causing it to brown and crisp more efficiently. From start to finish, plan four days with about 10 minutes of work where you coat the bird with solution and place it on a rack. “The work is zero, but the time is significant,” Jordan says. Combine 1 cup of kosher salt with 4 tablespoons of baking powder in a bowl (adding baking powder to the salt mixture helps improve the texture of the skin). Completely dry your turkey with paper towels before applying the salt mixture. Generously sprinkle the salt mixture on all of the surfaces of the bird including the inside cavity. You want to evenly coat the bird in salt but not completely encrust it. You will have salt left over! Only use what you need to cover the bird; how much you use will depend on the size of each individual bird. Put your salted bird on a rack and allow to sit in the refrigerator uncovered or lightly covered in plastic wrap for 24-36 hours. Do not rinse the bird after dry brining. If the skin is moist, lightly pat it dry with paper towels and allow to rest in the refrigerator for up to three days. The resting period is very important. It not only allows the baking powder to interact with the skin, it lets the salt do its thing and penetrate the meat, optimizing flavor. The key to delicious turkey is not overcooking and getting the whole bird cooked evenly. Oftentimes, the breast will overcook while waiting for the thighs to cook completely. You can fix this by loading the bottom tray of your oven with baking stones, baking steels or cast-iron skillets. These sit under your baking tray and focus very high heat from underneath, helping the legs of the bird cook through before the breast dries out. 1. Place your turkey breast-side-up on a V-rack set in a baking pan with edges that can collect juices. 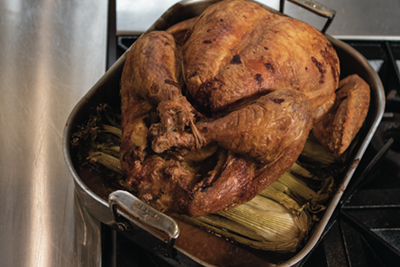 Allow to sit at room temperature for 1-2 hours so you’re not putting an ice-cold bird in the oven. 2. Preheat your oven loaded with baking stones, baking steels or cast-iron skillets to 500 degrees Fahrenheit. Allow to preheat for at least 45 minutes to an hour, “charging” your baking stones with high heat. 3. Pat dry a wet-brined turkey or do nothing to a dry-brined turkey. 5. When cooked, remove turkey from oven and allow to rest at least 30 minutes before carving. 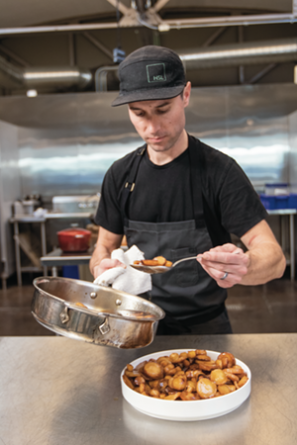 Chef Jordan Miller brings 17 years of professional culinary and world experience to the Wasatch Region, where he works as a private chef, caterer, consultant and culinary teacher at Park City Culinary Institute. His approach to turkey gravy is to use giblets to make it rich in flavor and to bring on the herbs! Chop reserved turkey neck, gizzards and trimmings into 1-inch chunks with a cleaver. Heat oil in a medium saucepan over medium-high heat until shimmering. Add turkey parts, onion, carrot and celery. Cook, stirring occasionally, until well browned. Add stock, soy sauce, herbs and bay leaves. Bring to a boil, then reduce to a simmer. Simmer for 1 hour, then strain through a fine-mesh strainer. 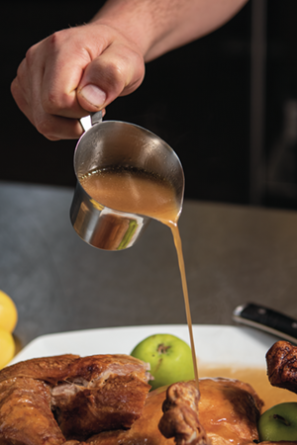 Add any drippings from the roast turkey, then skim off excess fat. You should have a little over 1 quart of fortified stock; if not, add water or more chicken stock to equal 1 quart. Discard solids and set stock aside. Melt butter in a medium saucepan over medium heat. Add flour and cook, stirring constantly, until golden brown, about 3 minutes. Whisking constantly, add fortified broth in a thin, steady stream. Bring to a boil, reduce to a simmer, and cook until thickened and reduced to about 3 cups. Season to taste with salt and pepper. The fine-dining equivalent of an exuberant greeting of “opa!” followed with a shot of ouzo, Manoli’s is all about Greek hospitality. Chef Manoli Katsanevas and pastry maven Katrina Cutrubus have brought the comfort foods of Greece into the 21st century, combining traditional flavors and Old World ingredients with modern techniques and international flair, as is the case with this savory bread-free stuffing. In a large sauce pan over medium heat, sauté onion and garlic with a little olive oil for about 30 seconds. 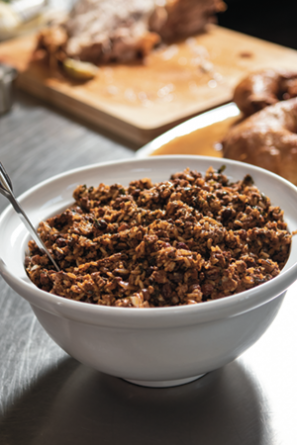 Add ground beef and gizzards, and cook until browned, breaking up the ground beef with the back of a spoon to crumble. Add tomato paste and stir until it evenly coats the meat mixture. Continue to stir, cooking until paste darkens and sweetens. Add wine and chicken stock and bring to a boil. Add rice, reduce to a low simmer, and cover the pan. Let cook for 5 minutes, stirring every few minutes to prevent sticking. Add all the remaining ingredients, stir to combine. Cover and cook until all the liquid is gone and absorbed by the rice, about 15 minutes. 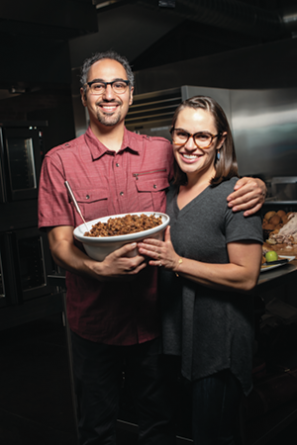 When discussing with chef Brandon Price which dish he’d like to contribute, we agreed that no Thanksgiving meal is complete without mashed potatoes. Adapting a traditional French recipe of a luscious potato dish called aligot, Price subbed in local Heber Valley white cheddar cheese for the usual tomme or laguiole with delicious results. Bonus: Preparing this dish makes for a great arm workout with all the vigorous by-hand stirring required to achieve the desired “stringy” pulled-cheese effect. Add potatoes to a medium pot and cover with water. Bring to a boil, reduce to simmer, and cook until potatoes are tender (about 10-20 minutes). A knife should easily pierce the potatoes if they are done. Drain. Meanwhile, heat the cream in a small saucepan until very warm (do not scald or simmer). Using a ricer, push the hot potatoes through the ricer back into the hot pot they were cooked in. Over low heat, use a heatproof spatula to move the potatoes around the pot for a minute or two so that all excess water evaporates. Add the cold butter to the potatoes a few cubes at a time, stirring continually until all butter is incorporated evenly. Keep stirring and add the warm cream in a steady stream. Keep stirring until the mixture is homogenous. Stirring vigorously, add the cheese a handful at a time. Keep stirring like you mean it until all the cheese is incorporated evenly and the spoon makes cheesy strings as you pull it away from the potatoes. Taste, and season with more salt if needed. 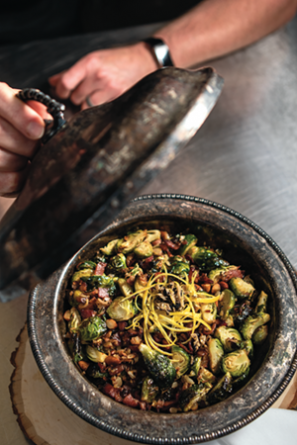 One of Devour’s favorite food celebrities, Chef Bryan Woolley, contributed this streamlined Brussels sprouts dish for the feast. The balance of savory, crunchy and fragrant elements come together in a way that will convince even the most hesitant sprouts-denier to give them a try. Plus, who doesn’t love seeing something with black truffle on the menu? The dish he chose to serve the sprouts in was his great-grandmother’s. When she died, it was given away to Deseret Industries. Years later, against all odds, he managed to find it again. • Preheat oven to 400 degrees. • Wash, trim off tough ends and quarter the Brussels sprouts, removing any leaves that are old or wilted. Set aside. • Slice the bacon into small bite-sized pieces. Fry in a large frying pan until cooked through and crispy. • Add the prepared Brussels sprouts to the bacon, as well as the minced garlic, sliced onion and slivered almonds. Sauté for about 2 minutes in the rendered bacon fat. • Transfer the brussels sprout mixture to a baking dish and place it in the oven for 20 minutes or until the edges of the Brussels sprouts begin to caramelize. • Remove from the oven and carefully fold in the finely chopped black truffles. Return to the oven for 2 minutes. • Remove from the oven, salt and pepper to taste, serve and enjoy! With an emphasis on local, seasonal ingredients at the fore, both the original Handle Park City and sister spot HSL in downtown Salt Lake keep customers happy while also supporting a bevy of local producers, garnering chef Briar Handly a long list of accolades, “Best of” awards and national media recognition. Adding yet another rare feather to his culinary cap, Handly was one of five Park City chefs invited to prepare a meal at the historic James Beard House in New York City this past September. 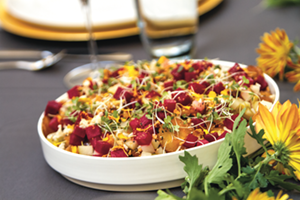 This smoky and savory root vegetable side featuring distinctive fall flavors is an adaptation of the dish he presented at the prestigious event. • Place all ingredients except for pears in a stainless steel container that will fit in your smoker. • Ensure the parsnips are submerged in liquid then cover the pan with tin foil. Poke a few holes in the foil to allow a bit of smoke in. • Fire up the smoker with fruit wood and smoke the parsnips for 2½-3 hours at no more than 250 degrees. • Strain off apple cider mixture into a medium-sized saucepan and place pears in the pan with the cider. Move smoked parsnips to a heavy-bottomed saucepan and reserve at room temperature until just before serving. • Poach pears slowly over low heat until tender. • Remove pears using a slotted spoon and set aside to cool at room temperature. • Reduce remaining liquid over medium heat to a syrupy consistency. • Just before serving, add a little bit of olive oil to smoked parsnips. Caramelize over medium heat until warmed through. • While the parsnips are smoking, roast the beets (recipe below) and prepare the candied seeds (recipe to the right). • Place all the ingredients in a roasting pan, cover with foil and roast at 400 degrees for a least 1 hour. Check after an hour to see if the beets are tender by poking with a fork. • Remove the beets from the oven, uncover. Cool in the liquid until safe to touch. • Strain the liquid off the beets and reserve. • Peel the beets and discard the skin. Cut the beets into ½-inch cubes and place in a bowl, season with the reserved beet liquid and salt to taste. • To a small saucepan add all ingredients except for salt. Bring to a low boil. • Cook seeds in the simple syrup until slightly coated yet still loose. • Strain seeds through a fine mesh strainer (or chinois) and reserve the syrup. • With seeds still in the chinois, plunge directly into a fryer set at 300-degrees and cook for about 3 minutes or until seeds stop “dancing” in the oil. • Remove seeds and place them on a lint-free napkin-lined sheet tray to dry, then season with salt while still hot. 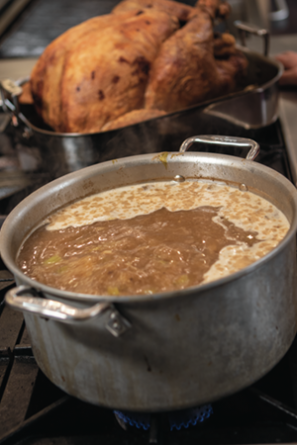 Mix together the smoked parsnips and the reduced parsnip and pear poaching liquid in a large bowl. Season with salt, sherry vinegar and lemon juice to taste. Top with sliced poached pears, roasted beets and candied seeds. A few years ago, Amber Billingsley was featured in a Devour story about “friendsgiving” potluck traditions, of which she’s been both a host and much-coveted guest of many. 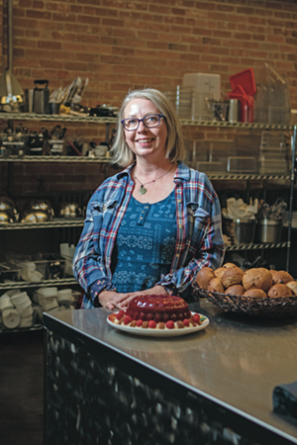 One dish she described is full of heart-dropping nostalgia: layered gelatin “salad.” “I absolutely love everything about Thanksgiving,” says Billingsley, who looks forward to any excuse to make this layered bit of jiggly joy. Billingsley recommends assembling the layers in the mold a day before the big dinner so the gelatin has plenty of time to set. If transporting, wait until you’re at the destination to invert onto a festive platter for serving. Combine all ingredients in small saucepan. Stir over low heat until mixture just comes to a simmer. Strain into a bowl, pushing to extract the solids, but leaving seeds behind. Scrape bottom of strainer. • Very lightly oil a metal decorative mold. Set aside in refrigerator. • In a 2-quart saucepan measure 1½ cups of cranberry juice. Sprinkle gelatin over juice and let soften for 5 minutes. Add sugar. • Very gently heat juice, sugar and gelatin over medium heat, stirring until gelatin is dissolved and mixture is hot but not boiling. Turn off heat. • Stir in remaining juice and raspberry purée. • Set saucepan over an ice bath, stirring occasionally until cool, and just starting to thicken. Gently stir in fresh raspberries and pour into mold. • Put in refrigerator to set. When the gelatin is set but still sticky to the touch, start the raspberry cream layer. This will take a couple of hours. • Pour 1 cup cold water in a 2-quart sauce pan. Sprinkle gelatin over water and soften for 5 minutes. • In a separate saucepan or kettle bring 1 cup water to a boil. • Add raspberry purée and sweetened condensed milk to the softened gelatin, then slowly stir in the boiling water. Stir until everything is nice and smooth. • Set aside over an ice bath and stir occasionally until cool and starting to thicken. 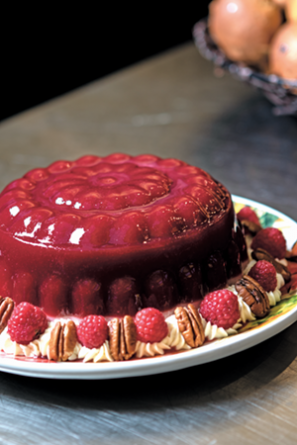 • Carefully pour over set cranberry raspberry gelatin, smooth the top. Cover with plastic film and put in the refrigerator. Let set at least 8 hours or overnight. • Fill a large bowl with warm water. Immerse mold into water up to the rim for 5-8 seconds. • Take out of water, pat mold dry, and give it a little wiggle to loosen it. • Set a cold platter over the top and invert. Give it a gentle shake and then slowly lift off the mold. If it doesn’t work the first time, don’t despair, just repeat the process. • Once it is on a pretty platter, decorate any way you want. Amber likes fresh raspberries, piped rosettes of whipped cream and pecan halves. It’s obvious that Lavanya Mahate is living her passion for Indian cuisine. With roots in southern India, the mother of two immigrated to the United States in 2001 in search of the American Dream. 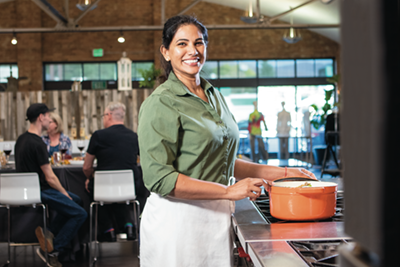 Now operating five eateries and a culinary school, you could say she is living that dream. Biryanis are complex mixed rice dishes that likely originated in Persia and can now be found throughout India and much of South Asia. But not all are created equal. Hyderabad, as the capital city of the state of Telangana in the south of India, boasts one of India’s most famous biryanis, one that blends the culinary traditions of the royal Mughal kitchen with those of the Nizam monarch. As such, it is said to be the rice of royals. Dum refers to the cooking process whereby the meat and vegetables are cooked over a low heat in a tightly sealed clay or brass pot that allows spices to unfold while keeping the meat juicy and savory. 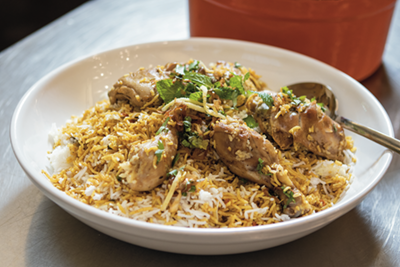 Mahate’s biryani uses basmati rice that becomes golden with the wide-ranging spices used in her dish; meats such as chicken and goat; and garnishes such as fresh cilantro, fried onion and mint. A dab of raita—yogurt cucumber sauce—cools and completes the dish. • Mix ginger garlic paste, red chile powder, turmeric powder and salt. • Blend cilantro leaves, mint leaves and green chiles with 2 tablespoons of water. Add this green paste (masala) to the marinade. • Add cloves, cinnamon stick, whole cardamom pods, black peppercorns and crushed fried onions. • Add beaten yogurt, oil, lemon juice and garam masala to the marinade and mix well. • Cover chicken with mixture and refrigerate for 1-2 hours. • Wash the basmati rice and soak it in water for 20 minutes. • Fill a cooking pot three-quarters full with water. Add cinnamon sticks, cloves, cardamom pods and salt to the water. • Bring it to a boil. • When the water starts boiling, add the soaked rice to it. • Cook the rice for about 8 minutes until it is three-quarters done. • Strain the rice in a colander and keep aside. • Smear 1 tablespoon ghee over the bottom of a cooking pan. • Spread half the marinated chicken evenly on the bottom of the pan. • Add half the rice and cover chicken with it. • Sprinkle the rice with half of the cilantro leaves, mint leaves and fried onions. • Also sprinkle half of the lemon juice and saffron milk all over the rice. • Repeat with the remaining chicken, rice and garnishes. • Make an elastic dough with 1 cup all-purpose flour, ½ cup water and ½ teaspoons salt. Roll out the dough into a thin disc and seal the edges of the lid of the cooking pan tightly. Or use aluminum foil to seal the pan and the lid. • Slow cook biryani over very low heat for 1 hour. Carefully remove the lid. 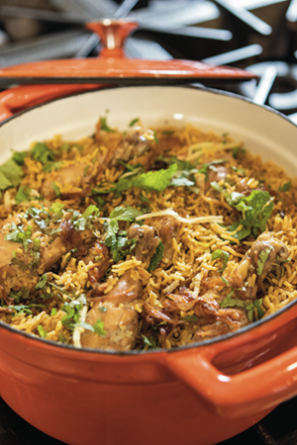 • Garnish biryani with more fried onions, cilantro. 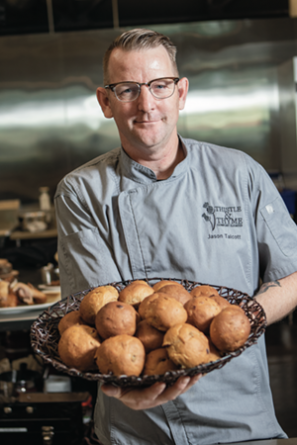 Jason Talcott is the enthusiastic chef at the Marriott University Park, which recently remodeled and rebranded its restaurant, Thistle & Thyme, and Wakara Bar. Talcott and his team are working to establish an East Bench “go-to”—a gathering spot for Geeks Who Drink, Paint Nite events, wine pairing/education, “paws on the patio” and Viva la Diva drag shows. 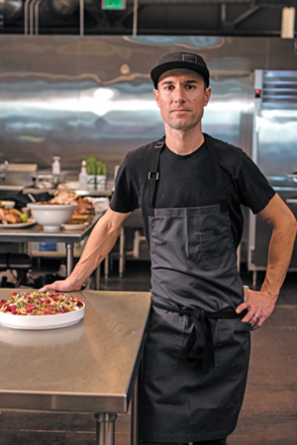 Talcott is a current Army Reservist, former chef to secretaries of defense William Cohen and Donald Rumsfeld, and has competed on Guy’s Grocery Games. The restaurant and bar team is headed by Miles Broadhead who brings experience at Bambara, Alemexo and Bistro 222. • Preheat oven to 400 degree Fahrenheit. Stir yeast, ½ cup water and molasses together in the bowl of a stand mixer fitted with dough hook. Let it actuate until foamy, about 10 minutes. • Add salt, flax seeds, melted butter, 1¾ cup additional water, rye flour and whole wheat flour. Beat until smooth. • With mixer on low, slowly add 3 cups all-purpose flour. Turn mixer up to medium high and knead for 8-10 minutes until smooth and elastic, adding additional flour as necessary. Turn dough out onto lightly floured surface and knead in pepitas, sunflower seeds and cranberries. • Let the dough rise in an oiled bowl for 1 hour or until doubled. 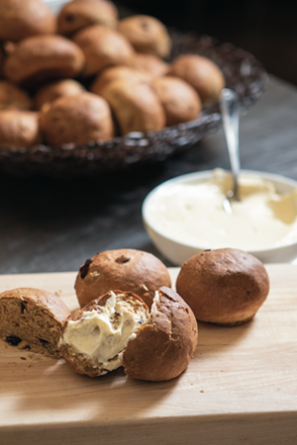 • Shape the dough into rolls and let rise for 1 additional hour. • Mist with water using a spray bottle and sprinkle with any remaining seeds for topping. Bake for 30-40 minutes, misting the oven with water twice in the first 10 minutes for a crunchier crust. • In a mixer or with hand mixer whip soften butter, bourbon reduction and maple syrup until incorporated and “fluffy” but not over mixed. • Apply in generous amounts to warm rolls! Utahns are famously fanatical about ice cream. 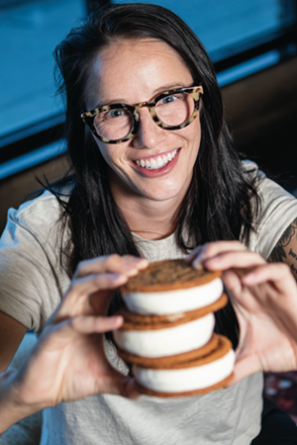 So, it seems fitting that pastry chef Alexa Norlin (formerly at Current and Handle PC/HSL) chose to share a version of the superlative ice cream sandos she serves at her wildly popular soft-serve ice cream truck, Normal, combining the spice-forward flavors of fall. Plan to make these treats in advance and keep frozen until ready to serve, saving crucial room in the oven on pie day. 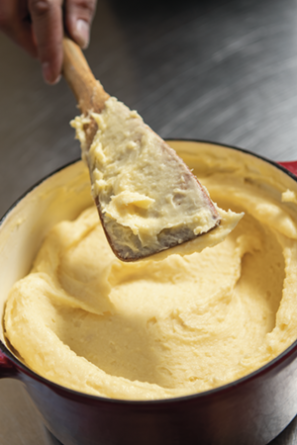 • Cream the butter, sugar and salt in a stand mixer with paddle attachment until light and fluffy. • Add molasses, mix well, scrape down sides of the bowl. • Add egg, mix well, scrape down sides of the bowl. • Combine all dry ingredients in a separate bowl, sift together. • With the stand mixer on lowest setting, slowly add the dry ingredients to bowl of stand mixer and mix until fully combined. • Cover the dough with plastic wrap and refrigerate at least 4 hours. • Once chilled, scoop cookie dough and shape into about 20 2-tablespoon balls. • Place onto a parchment-lined baking sheet. • Bake at 325 for 10-12 minutes. You want the middle of the cookies to still look puffy. When you remove from the oven, smack the sheet tray down on a surface and the cookies should deflate. • Let cool for 5 minutes, then further cool on a rack to room temp. 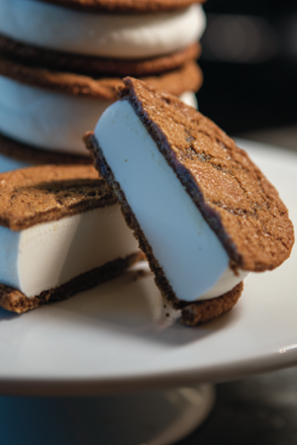 If assembling immediately, freeze cookies for at least 30 minutes before sandwiching with ice cream. Otherwise, the cookies may be stored in freezer zip-top bags or an airtight container for up to one week. • Combine heavy cream, whole milk, sugar, salt and glucose in a heavy pot, bring to a simmer (stirring constantly so the dairy does not burn). • Remove from heat, pour into an ice bath (one large bowl filled 2/3 with ice and 1/3 with water, a smaller bowl on top of the ice water so the base can cool quickly). • Once cooled, combine ice cream base with xanthan gum and cream cheese in blender or use a stick blender. Blend until fully smooth (can do in batches if needed to prevent splashing). • Spin ice cream base according to manufacturer’s instructions using a store-bought frozen bowl mixer, Kitchen Aid ice cream bowl attachment or even dry ice. • Once the ice cream is finished spinning, transfer to a freezer safe container with airtight lid. Freeze uncovered for 1 hour if assembling immediately. • For longer storage, add lid after one-hour cooling. Before assembling, allow ice cream to soften slightly at room temp to aid spreading between the cookies. • Remove ice cream and cookies from freezer, divide ice cream equally between the cookies and sandwich between cookie pairs. • Place sandwiches back in freezer for at least four hours. If not serving within 4-6 hours from prep, wrap each sandwich individually in plastic film. May be stored wrapped in an airtight container in the freezer for up to two weeks.